The medium is the message. While walking by the medical science building or Gerstein library, you might have noticed a large board spelling out the word “HIV”. But this isn’t just any old promotional poster. It is an art installation entirely made out of condoms. This art installation is a tri-campus initiative to raise awareness about the HIV/AIDS epidemic. 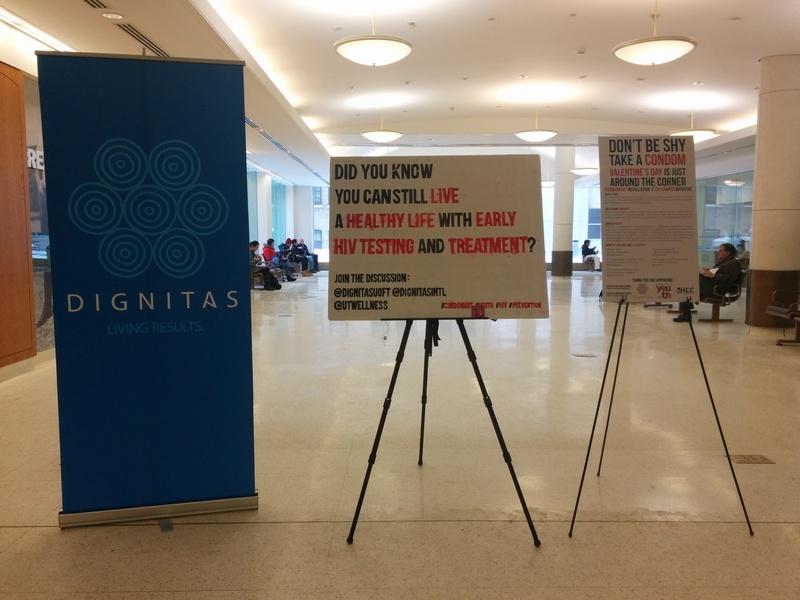 Dignitas U of T and the Health & Wellness Centres spearheaded this awareness campaign across all three campuses. Dignitas is a student run organization that aims to provide better quality of life with dignity for children, youth and families affected by HIV/AIDS in resource-poor settings. With Valentine’s Day just around the corner, this art installation could not be more apropos. The idea is simple and elegant. Students and faculty members passing by are encouraged to interact with the art piece by taking one of the condoms. With each condom taken away, a message is slowly revealed. This message could be a HIV statistic or a glimpse into the life of a HIV/AIDS patient, with each campus having different messages. Yi-Min Chun, President of Dignitas U of T and mastermind behind the exhibit, recalls the incident that inspired her to create this installation. “In my first year of university, I saw volunteers from the U of T Sexual and Gender Diversity Office giving out condoms at the corner of Robarts. The funny thing is no one took them. I do not know whether it was because no one felt compelled enough to take it, or whether it was because they were too shy, felt stigmatized or pressured under the watch of strangers”. This year’s condom art installation has already generated a lot of interest in the student body. By the second day, the art installation in Medical Science building was already depleted of condoms. Through a creative amalgamation of art with health, Dignitas and the Health and Wellness Centres are tackling the stigma and misconceptions surrounding HIV/AIDS one condom at a time.